The little village of Skala Eresos is about to be shaken up with the annual women’s festival which takes place from 7 to 21 September. During these days women from all over the world will flock together, will dance, drink and flirt, but they’ll also attend workshops, make music and visit exhibitions. 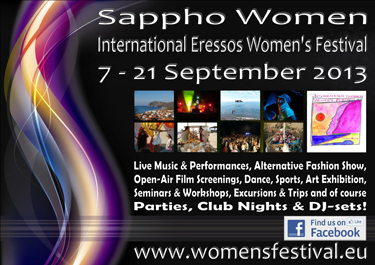 This women’s festival is only one of the many festivals you can find on Lesvos. There’s the Sardine Festival of Kalloni, the Ouzo Festival in Plomari and this summer for the first time, in Mytilini and Sigri, there is a Commerce Festival in mytilini, a Beach Street Festival in Vatera and the Chestnut Festival in Agiasos. These are only the festive days that do not have a religious background, although most of the holidays in Greece are based on a religious event. Christmas, Easter and the Assumption of Mary are the biggest High Days; Easter coming first with many other celebration days connected to this Holy Event. Of the Greek-orthodox calendar of name days (Greeks celebrate their name day and not their birthday), dates that are not dedicated to a saint form a big minority. And it’s not only individuals who celebrate their name day; so too do all churches and chapels (and there are so many of them). These celebrate the day of the saint in whose honour they are built, as do all cities and villages who have a patron saint who will be honoured once a year. For instance, on the last Sunday in July, the patron saint of Molyvos gets a little party, see: The Robinson Crusoe of Molyvos. You see, Greeks are always busy feasting. Just like today, it is the name day of all Eves and Evanthia’s. I know at least three of them and according to Greek tradition they all have to be bestowed with your best wishes, and, if good friends, they should be visited. If you are in Skala Eresou then you also participate in the festival and I am sure somewhere on the island there must be a chapel dedicated to Saint Eve. There are not so many people named after Evanthia, but imagine October 26th when all Dimitris’, Dimitra’s, Mitsos’ and Stephanos’ are celebrated, or January 7th when all Yannis’, Yanoula’s, Ioanna’s (and all other variations on this name) are going out to have a party. Then half of Greece is celebrating, because who does not know a Yanni or a Dimitra? And now there are more and more Greeks starting to celebrate their birthday as well. Are they clever: they get spoiled twice a year! But we’re not yet at the end of the list, because not only the name days of the saints are celebrated, there are also days where an event connected with such a saint is a reason to throw a party. As on August 29th when we went to a taverna in Skamnioudi and found the place empty. No customers, and the staff there had all gone to the village in order to celebrate the day of the Decapitation of John the Baptist. One of the stories goes that John was arrested by Herod Antipas because John made critical remarks about the fact that Herod wanted to divorce his wife in favour of his sister in law. When Salomé, Herod’s niece an daughter of his beloved sister in law, enchanted him with a beautiful dance he accorded her a wish. It was probably her mother who had whispered her the wish for the head of John the Baptist, which was brought to Salomé on a golden plate. You think this is a reason to celebrate? Coming on September 14th there will be another similarly odd day when shops in Mytilini will be closed for the occasion of the Elevation of the Holy Cross. I have never heard about this, but it is indeed a Catholic and Orthodox celebration of the day that the Holy Cross (on which Jesus died) was found. Flavia Julia Helena was the mother of Constantine the Great (the Roman emperor who stopped the Christian persecution). While he was emperor he took his mother to visit Palestine and Helen went on a souvenir hunt. She discovered the grave of Jesus, took some souvenirs from the remains of the Three Holy Kings and also found the Holy Cross. Later on she was proclaimed a saint, but obviously only a name day was not enough, so her discovery of the Holy Cross became worth a celebration day too. So if you don’t know of these semi-holidays, you could well travel to Mytilini and find shops closed because the shopkeeper wants to celebrate the Holy Cross. Wouldn’t it be better if only Stavros’ and Stavroula’s, named after the Holy Cross, were to celebrate that day? And finally Greece has also some politically related holidays like March 25th Independence Day, October 28th Ochi day and November 8th the local Independence Day on Lesvos. So if you want to find a day without a party on Lesvos, you will need some planning and research.